This newspaper clipping comes from the August 13, 1944, edition of Grit. 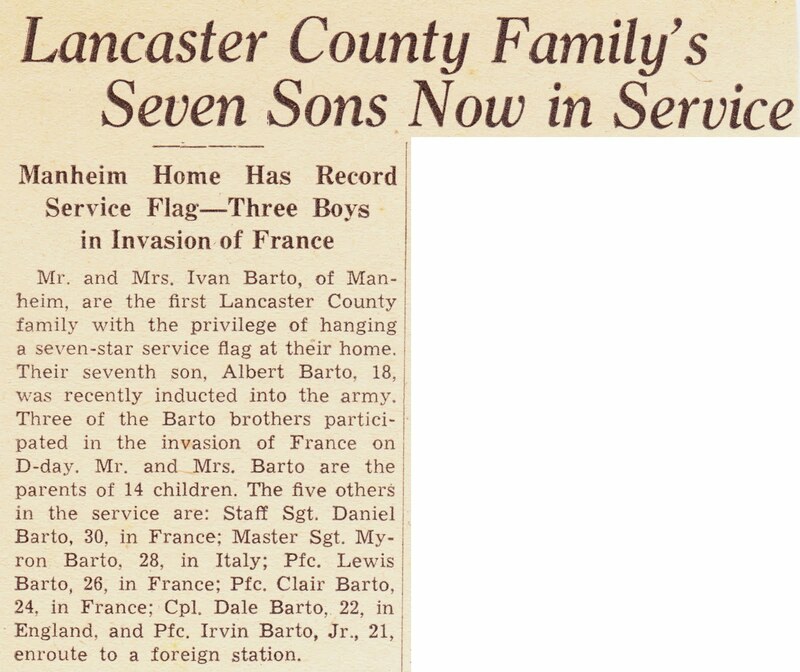 The short article from nearly seven decades ago describes the Barto family of Manheim, Lancaster County, Pennsylvania. I don't know if all of the Barto brothers survived World War II. According to notes by Margie Barry, daughter of Albert, on The Albert Barto Family Home Page, most of the Barto siblings lived in Manheim for the rest of their lives. Myron, however, "lived much of his life in York, Pa."
Having five or six or even seven brothers serving in World War II was not that rare. The most famous (and saddest) instance was the five Sullivan brothers of Waterloo, Iowa, all of whom died during or shortly after the sinking of the USS Juneau in November 1942. Right here in York County, and across the Susquehanna River from the Barto brothers in Manheim, we had the seven Hake brothers of Wrightsville, all of whom saw combat in World War II. The transcript of an oral history interview with Charles K. Hake, one of those seven brothers, is housed at the University of North Texas library. so long ago and still - so sad. It would be nice in a case such as irvin's, to think a buddy was with him at the end.